My Boat, hard to say, possible 1920/30 C.G. Pettersen? White oak hull, day cruiser. I haven’t been able to identify the boat due to lack of paper work and origin. The shape and the interior layout suggest I'm on the right track. Hi, I'm bringing my boat into a large warehouse for the next few years to work on it. It's 25 ft white oak hulled day boat, weight about 2 tons. Question 1:- any ideas as to a ideal humidity for white oak? Question 3:-am I being too careful? Would welcome a few comments. The engine is out, took 3 of us and a fork lift truck. The engine mounts are out need replacing, also scraped about a ton of gunge out from under the engine, was able to see the first glance condition of the hull as I've got most of the flooring up as well. If I'm lucky the planking is only deformed not broken. When the paint's off the keel and the inside I'll be able to see more. Is there any way to ascertain the weight of the boat without it having to go over a weighbridge, just in case I get a good offer on a trailer? Next job is stripping fixtures and fittings, all to reduce weight on the keel. Good news the propeller shaft turns freely, meaning that the shaft tunnel is in order. Bad news: - I took a deko at the wiring behind the dash, that's a theme for another day. Comments for 1920/30 C.G. Pettersen? I have a 1931 wickes with the bent forward cabin board and porthole windows that I think yours has also . I believe that ideal moisture content for oak is between 8 and 9 percent. I read somewhere that wood should not have more than 25% moisture content in it. I'm only guessing that you're bringing her in because its probably been some time since she has been overhauled due to deformation. It's inevitable with these older boats cuz we all know they were never intended to last more than 50 years, or so I read that somewhere too. It sounds as though she is slightly "hogged". being sufficiently supported while on the trailer. Your idea for correcting this might just work but check the keel first to make sure there is no structural damage. You could keep her moist by laying some damp absorbent material such as old sacking along the keel and keeping it moist. Your offer of expert furniture restoration help will I’m sure be much appreciated by everyone. 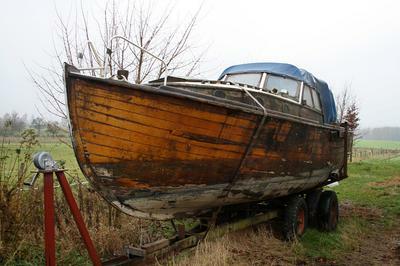 We get plenty of questions about how to restore the ‘finish’ on antique boats. There seems to be quite a sizable concave movement of the hull directly under the engine,due most likely to too much weight directly on the keel. The problem being nobody knows exactly how long she's been trailer bound. I intend to put her up on jacks as soon as she's inside and remove the engine and let the keel hang loose ;do you think she'll reform if she doesn't dry out to quickly? Maybe accurately placed sand bags along the backbone and just wait. I'll try and reduce the weight as much as possible ,doing a complete strip down inside, refurbishing all the wood work in the workshop. Maybe I haven't mentioned it, I'm an antique furniture restorer and this is my retirement project, meaning if any club members want tips on restoring furniture I'm very willing to assist. I don’t believe that you need to worry too much about the humidity. She will dry out of course, and she will need to take up again when she goes back in the water. And as you say there will be a certain amount of movement. But I think that as long as she dries out slowly and naturally there shouldn’t be any problems. You might get some ‘shakes’ in the timber but these should close up when she eventually takes up again. It might help if there were some open buckets or troughs of water nearby or under the boat that are simply allowed to evaporate in her vicinity. And keep her away from any heat source. On the plus side, if you intend to use some of the ‘modern’ sealants, caulking or paints many of them require the timber to have a very low moisture content. Sorry I can’t help with the search for Swedish boats you seem to have delved fairly deeply already. However, there is a "Swedish Classic Boats" forum at http://swedishclassicboats.ning.com/ that is more likely to be able to help you. As for the keel damage, all I can suggest at this stage is to get her into the workshop, jack her up and then remove the garboards so you can see exactly what the extent of the damage is.